Many of my friends know of our Sunday tradition… it’s a day of rest and I really LOVE how the pioneers really took that literally and didn’t cook, wash, or do any work of any kind! Now I do think it kinda went to the extreme, but I also think we do not take it seriously and don’t truly rest on the day of rest! I’ve certainly been known to throw in a load of laundry on Sundays. We live such busy and full lives these days and by we I mean all Americans. We rush from one thing to the next and if we have a spare moment we are on one of our many electronics finding something to entertain. Sundays are often the same and don’t feel like it’s much of a different day of the week. From the early days of our marriage, Brian and I decided that we did want to keep Sunday as a special day and treat it differently than other days. After church in the morning we either come home for a family day at home, or spend it with one of our extended families nearby. Rarely do we do much else. It’s a day spent enjoying relationships and making them stronger. So what does this essay have to do with popcorn? A LOT! As I mentioned above the early Americans didn’t even cook on Sundays… they ate cold leftovers. We don’t quite do that, but I want to rest and not worry about dinner prep. It’s nice to not have to plan a meal or heat it up or spend any time over the oven! How is that possible??? We have green smoothies and popcorn! It has become a tradition and well liked by all! It gives us lots of free time in the afternoon and evening to play games or just fool around together. It’s amazing how much time food prep takes out of the day! Brian usually mixes up the smoothies and I slave over the popcorn… not really… I mean I don’t slave… it’s one of the easiest foods in the world to prepare! Just pour a tablespoon or two of coconut oil (or lard or other fat of choice) in the bottom of the frying pan, cover the bottom of the pan with popcorn kernels, put the lid on and just wait! I shake the pan here and there to keep the kernels from burning, and then just remove it from the heat once it stops popping! Super simple! We have two favorite flavors that we alternate between, but there are other flavors we have tried as well. [amazon_link id=”B001E5DZZM” target=”_blank” container=”” container_class=”” ]Sriracha[/amazon_link] Pop- just dump on to taste and sprinkle with a little pepper! Salt and pepper – Brian likes this one a lot. The kids and I aren’t such huge fans. Honey Cinnamon – for a sweet finish and hot sticky mess! Drizzle fresh popcorn with honey and sprinkle with cinnamon! We love trying new flavors… these are some of the ones we liked. We tried one with nori (dried seaweed) and it didn’t quite turn out. The nori didn’t have enough flavor to add to the popcorn. 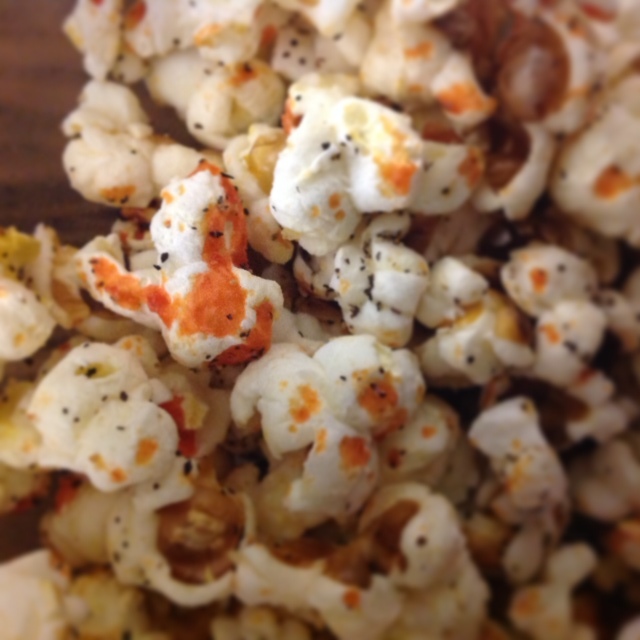 We love nori, but not in popcorn! What have you tried? Have any flavors we might like? Please share! That sounds pretty awesome… and since I’m not on facebook I didn’t even know you had moved to Denver! You remember Amy (Trostle) Floyde? They are now in Denver too and Ron and Judy are moving out there! 😉 Small world! 😉 We are hoping to visit in the next year or two so we will definitely look you up! I just made some popcorn the other night for the kids and I. They just had regular butter and salt. But I made mine with a little butter and Sriracha. I was so good!!! Thanks for the ideas!